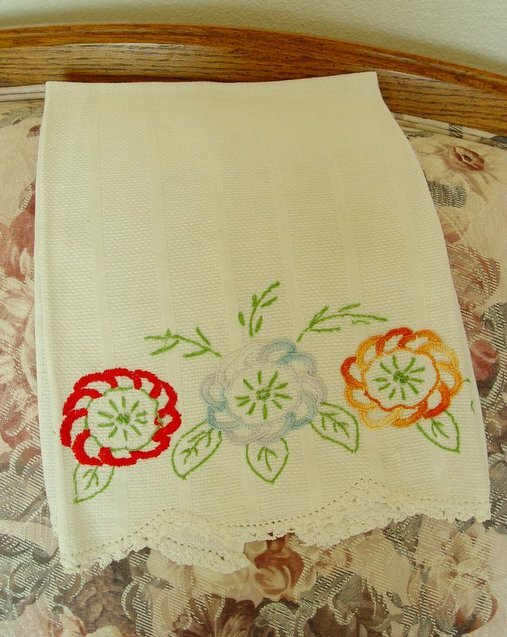 This vintage tea towel also came from the fruit stand consignment shop! It features a textured, woven linen tea towel with a hand crocheted, scalloped trip. The embroidery features varigated threads and uses a stitch that is used infrequently in this modern age. I enjoy it because it is cheerful and well-stitched. Hi Lucy. . .isn't it pretty? I paid about $5.00 for it and think it was a real bargain! It's so nice to hear from you. Has autumn arrived in Holland yet? My aunt lived in Germany for 30 years and did much traveling. Holland was one of her favorite places to visit --- and she did visit it at least once every year! I wish I could. Thanks for the comment; have a wonderful day!